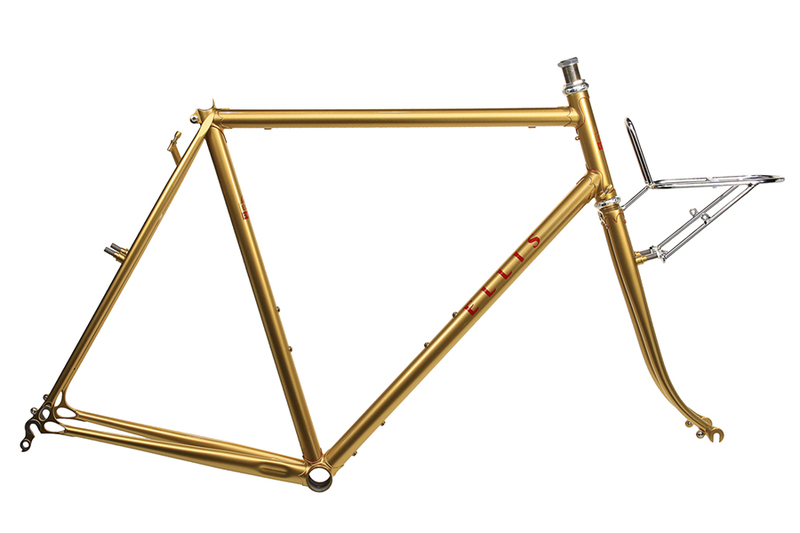 Edward contacted me this past summer wondering if there was a way to add a disk tab to his 1995 lugged, silver brazed Waterford frame. I know we used to get this question from time to time while I was at Waterford, and I think even Edward contacted them before he got in touch with me. I know Richard has no interest in doing these types of modifications, and if you're talking about just brazing or welding on a tab, for good reason. 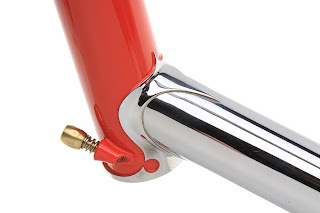 These bikes and the tubing weren't designed for the stresses that a disk brake is going to exert on the frame, and secondly, the tab would have to be silver brazed onto the stainless Henry James dropouts, not the strongest setup. I proposed that I replace the dropouts and seat stays to better handle the new parts, and it should give this old bike quite a few more years of service. 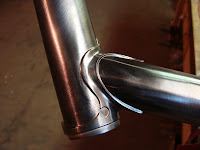 After I got the paint off the old frame, I could see that there was some cracking starting in the seat stay braze joint. The old seat lug was also having trouble keeping the seat post tight, as you can see the tabs were pretty severely bent inwards and essentially bending the seat post bolt before it could tighten properly. This was another area that needed fixing. 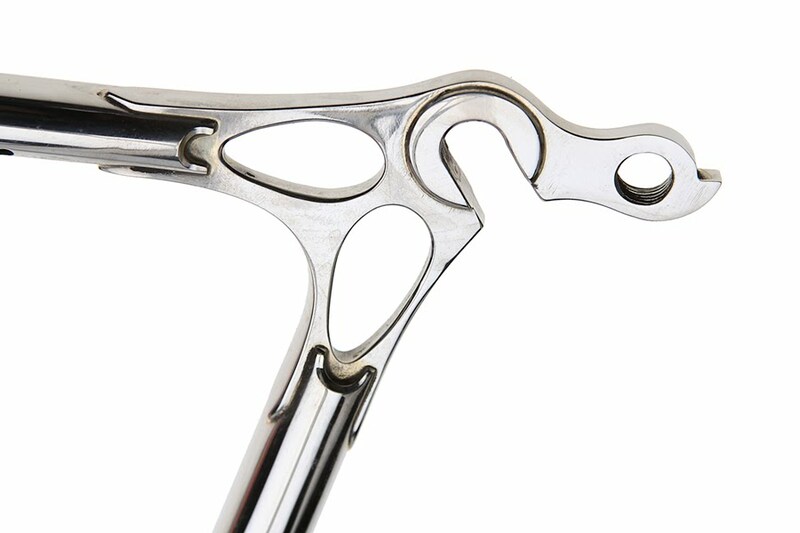 Nice old school Henry James dropouts. Nothing wrong with them, just not gonna work with a disk tab. 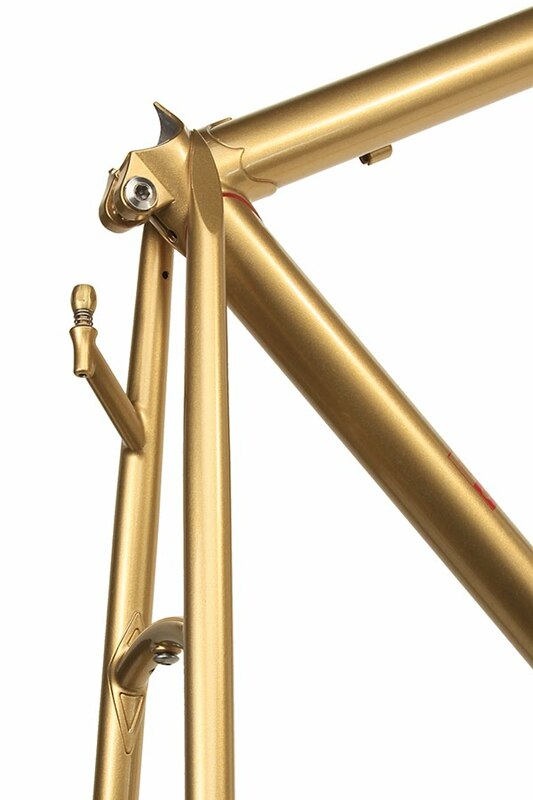 Here you can see the new Paragon chain stay mount disk dropouts after all the modifications. I reused the chain stays, they're pretty unique, with asymmetrical bends and a round oval profile. This picture should probably be after the next one, but here goes. The new seat stays with tons of clearance for big tires. The old seat stays had no bend and clearance for maybe a skinny 2.1 tire? I noticed when I got the painted bike back from Edward that the paint was rubbed off on the insides of the seat stays. 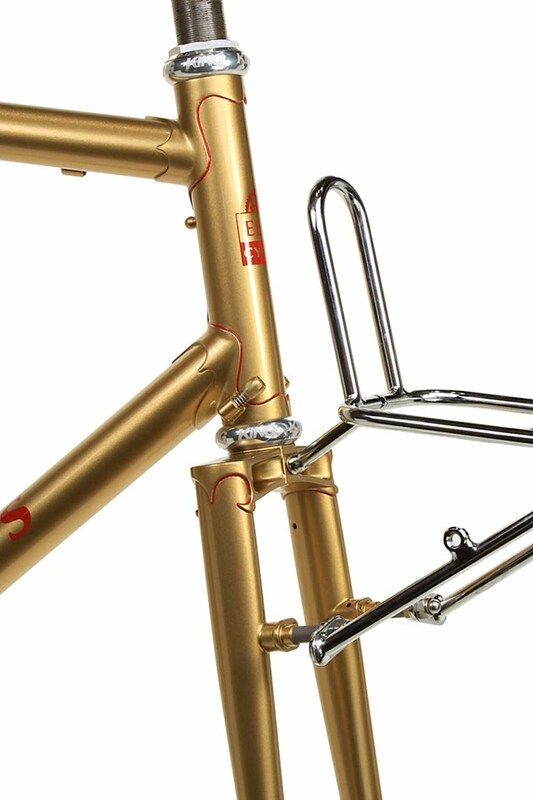 Here's the new seat lug and top tube derailleur routing. The old Waterford bottom bracket and the new braze ons for the rear disk brake. If you look closely, you can see the "bumps" I added on the inside of the chain stays for tire clearance. Another shot of the tire clearance "bumps". When I reused the chain stays, I needed to take some material off the minor end of the stays to account for the extra length of the new dropouts. 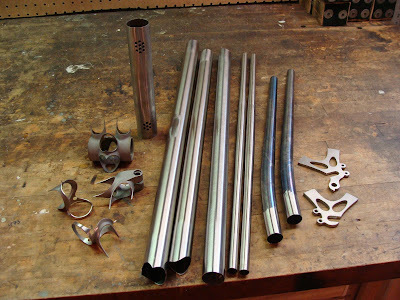 The completed project, along with the old bits and an extra set of Paragon dropouts that I'll be using on my 29'er at some point! 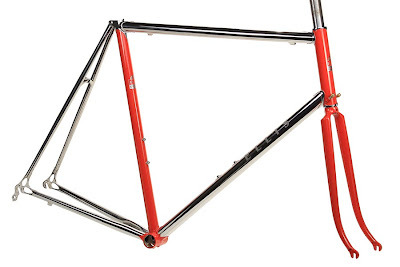 OK, for those of you who haven't been watching the blog, Chris couldn't make up his mind on exactly what type of Ellis frame he wanted, so I surprised him. He received the frame yesterday, so now I can finally post some photos and not worry about ruining the surprise. Parts all laid out, ready to fixture the main diamond. 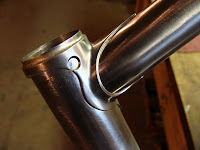 A couple close up shots of the head lugs, before and after brazing. The stainless brake bridge, post braze with the flux still hot. After some careful finishing with very fine emery. A little out of order here, but here's a shot of the seat stays, mitered and dry fit. I had to heat the ends of the stays just a bit and then squeeze them just a touch to get them narrow enough to fit up with the seat lug. The stays, freshly brazed to the seat lug. More careful finishing with 280 grit emery. Finally, the finished product. Chris is going with a Campy Super Record group, so what better color than red for an Italian equipped bike. Jason's amazing masking skills on display in the super clean shorelines around the head lug. I'm really happy with the "fastback" style seat stay attachment. 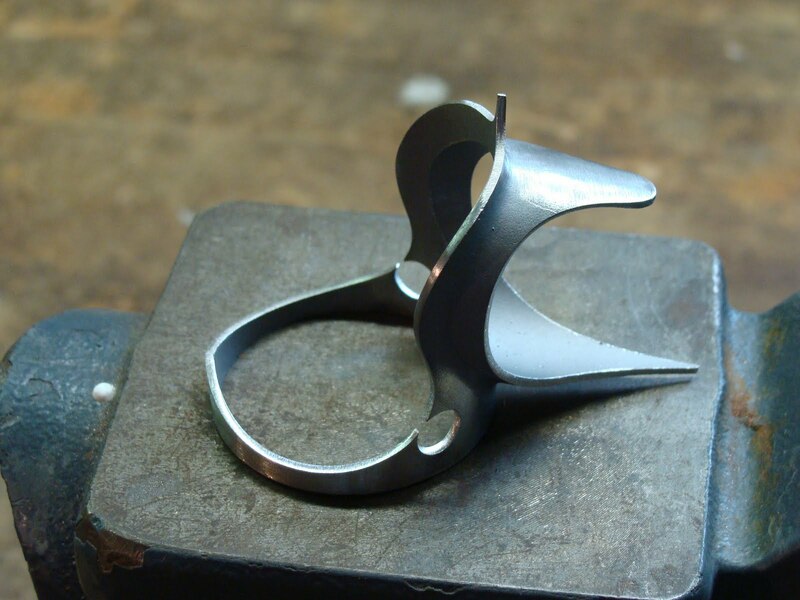 It allows me to use the cool curved brake bridge even on large frames where a side tack arrangement would be too wide for that particular bridge. Plus it looks pretty cool too! 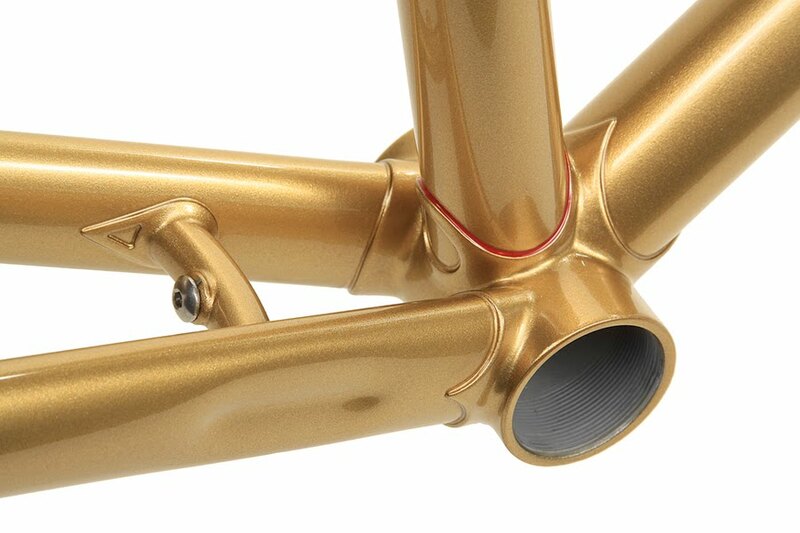 A nice shot of the inside of the dropout, lots of work goes into those clean points and scallops. 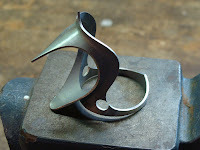 More pics of this one on the website soon. I'm sure like a lot of folks I've been contemplating the need for a land line and a cell phone. I've switched all my business cards and the website over the last year to my cell number, but some of you out there may still have a card with my land line number on it. I discontinued the land line (262) 806 7377 this morning, any calls should be directed to my cell number (262) 442 6639, and I look forward to hearing from you! Finally, a blog post with no pictures isn't any fun, so here's one of Jason and Willy, (thanks for the photo), at the Furnace Creek 508 with his Bilam Ellis. From what I hear, Jason and the bike performed great! Chris should be getting his surprise Ellis today as well, so once he's seen it, I'll post pics for everyone who's been waiting! Tom drove up from VA this past Friday to pick up his new Ellis. We got the bike built up and had a chance to enjoy some great riding weather. I used some Sachs Rene Singer lugs and a Pacenti Paris Brest crown for the full classic rando look. Tom choose to go with a Nitto M12 rack up front, and I made sure it fit up nicely with the canti mounts. Jason pinstriped the head lugs and fork crown to "frame" the head tube and logo. On the seat stays, you can see the canti brake cable stop, curved bridge with tangs and fender mount, and the subtly pointed seat stay tips. The curved chain stay bridge also get a fender mount and tangs. 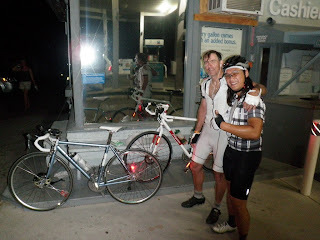 Tom took a short solo ride on Fri afternoon, and then we got back together on Sat. morning for a longer ride. Headed out west of Waterford into the hills and gave the new bike a proper shakedown. Below you can see Tom grinding up a hill while I snap a photo or two! We stopped for a shot or two of the Ellis'. 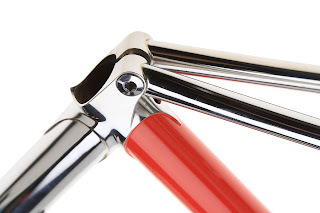 I rode my cross bike with the fat 32c tires..., cush! We enjoyed some of the nicest Oct. weather you can possibly get in Wi, and the fall colors were in full effect. Below, a shot of Tom heading up one of the last climbs of the day with a brilliant backdrop of fall color.